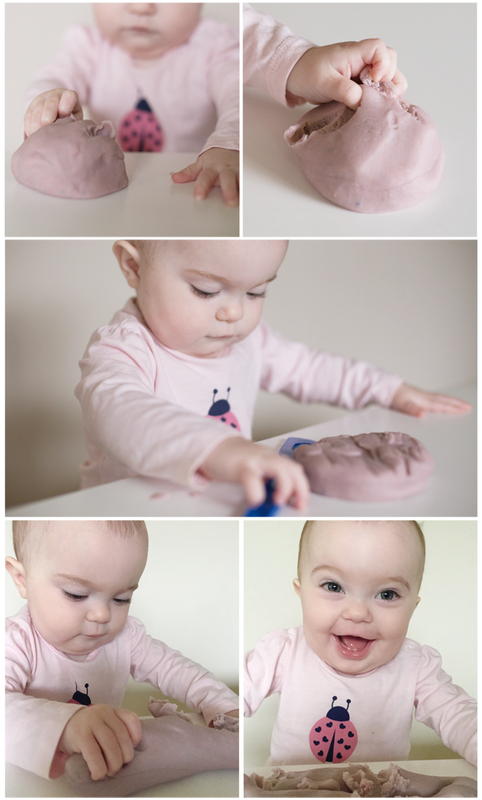 This week, we made some play dough for sensory play! As a teacher, I've had to make my own fair share of play dough but I've always followed the recipe on the back of the Cream of Tartar tin. I stumbled across a fantastic no-cook recipe on Pinterest last week so I knew I had to try it! The following recipe is from The Imagination Tree - one of my favourite blogs! You just mix it all up in a bowl and then knead it together. It's such a nice consistency! You could also add glitter and some flavouring such as green glitter and peppermint for Christmas play dough or strawberry with red glitter for Valentine's Day. The options are endless! We stayed with a nice neutral light purple for our first go! Lilly wasn't too sure to begin with and kept peeking up over the coffee table to see what was going on. She would pick a tiny bit off which would stick to her finger so she would shake it around until it fell off. It wasn't until I started playing with it that she became interested! Hi Casey! This is absolutely adorable! I have a 9 month old, do you think she is old enough for these types of play??? thanks!! !